We are more than halfway into 2011 and this past weekend I had the pleasure of seeing my second '11 film in a theater. The first was back in March for The Adjustment Bureau, which I enjoyed, and I'm happy to report that Super 8 (2011) puts me at two for two. I don't go to the movies often, so I'm always happy when I make the effort to go and it's not a stinker. 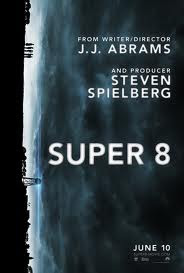 Many said Super 8 resembled some of Spielberg's earlier works (Close Encounters, E.T. ), but for me, The Goonies (a Spielberg production, oddly enough) is the closest movie that mirrors the energy and spirit of Super 8, and that's a huge compliment. These kids are hungry for adventure; instead of having one last Goonie hunt, these guys just want to make a good zombie movie. They are genuinely frightened by the events that follow, and while they bicker endlessly, they share a deep affection for one another. There's even a love triangle. 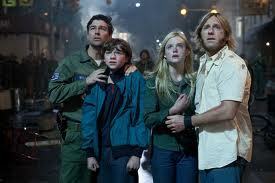 It's all very reminiscent of that '85 Richard Donner classic, though Super 8 doesn't quite make that perfect landing. I have some problems: Remember Chunk? Data? Brand? Mama Fratelli? Of course you do. Now, name at least 4 characters in Super 8. Exactly. These characters are very thin, distinguishable mostly by physical characteristics. With the exception of Joe Lamb (Joel Courtney) and Alice (Elle Fanning), I don't think the kids were well-cast. Sure, they are given funny bits of dialogue and imbue a terrific sense of camaraderie, but it was not enough to make them stick with you forever. And as much as I love seeing Friday Night Lights' Kyle Chandler as Joe's dad (and Abrams certainly loves filming him, zooming closely on his face on many occasions), the role he plays feels shallow. Even Noah Emmerich's villainous government operative is a stock figure. I was really hoping J.J. Abrams filmed a scene where we meet Nelec's mentally unstable and disfigured rocky-road-ice-cream-loving brother. Another problem: the special effects weren't so special. I wasn't impressed with the train wreck. It was overkill. I understand it was supposed to be a big enough crash to unleash the film's mystery element, but I felt it was a bit excessive with all that flying debris. And that big reveal? It's not so much that the creature was disappointing, but it just felt out of place. I know it's a monster movie, but I preferred it when the monster's presence was disguised and low key. The movie was not all about the monster, and that's when it clicked the most.